Thousands of Hindus across the world will be tying the knot on Sunday 16 May. BBC Asian Network's Catrin Nye investigates the phenomenon. "I've hardly slept, everything is just clashing all at once. We've had to use new companies to source the flowers, cars, favour boxes. Once Sunday is over I think it will be time for a nice long sleep." Those are the frantic words of wedding planner Rita Yadav who is severely under pressure ahead of a weekend of great importance in terms of Hindu matrimony. She is planning three Hindu weddings taking place on Sunday 16 May in west London, but that is only part of a bigger and amazing picture. The day and date in question is one thousands of Hindu couples across the world have been waiting for to get married because it is said to be blessed. And, this year, with it following months of unsuitable dates, a backlog of brides and grooms has built up. Some estimates say that in the Indian city of Mumbai (Bombay), which is dominated by Hindus and is the centre of Bollywood, 50,000 weddings have been planned for the day, including that of Indian cricketer Pragyan Ojha. In the UK, the Hindu Council has approximately 250 priests and they have all been booked for the day, with many having had to turn down some requests to conduct weddings. Dr Raj Sharma, president of the Hindu Council UK, is one of those as he will be travelling to the Netherlands to marry a Hindu couple at The Hague. He says that there are four or five times the usual number of bookings on this particular day. "Hindus believe a union between two souls is very important and choosing that auspicious date is incredibly important," Dr Sharma told BBC Asian Network. "It has been particularly inauspicious between February and 16 May - our scriptures telling us that this would be a period of calamity, and so it has caused this backlog. "Most Hindus, even if they are marrying non-Hindus, would want to marry on an auspicious date to build the best foundation possible for their relationship." If it's going to make my chances of a happily-married life more successful then why not? "I answer, just as people are able to predict the weather and other such phenomena, we have a science called Jyotish which has been used for thousands of years and hasn't gone wrong." 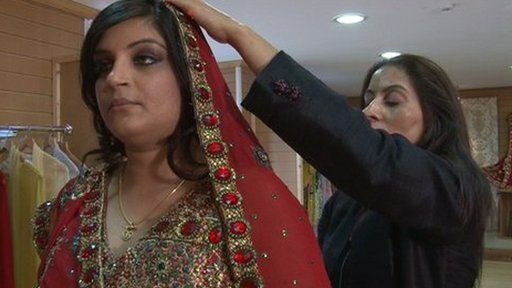 Wedding planners have told BBC Asian Network they know of at least 32 Hindu weddings in west London on Sunday, including that of Hindu bride Phillipa Tailor. "My mother-in-law requested that it took place on this date," said Ms Tailor. "I spoke to my other half and we were both more than happy to do it. "If it's going to make my chances of a happily-married life more successful then why not?" The brides will have their choices when it comes to their dress, venue, food, hair, make-up and henna but, in terms of date, it is not the same case. Jay Sidhu, who is a Sikh woman marrying Hindu Sanjiv Kumar, chose 16 May mostly for the sake of the in-laws. "I'm marrying a Hindu and my in-laws are very religious, especially my mother-in-law and Sunday is a very religious day," said Ms Sidhu. "It's more for my mother-in-law but also a blessing for us." Ms Sidhu is not the only one respecting the family with the choice of date. For Kiran Grewal, who is also a Sikh woman, it was the obvious date. She is marrying Hindu Pardip Bithal in another west London ceremony on Sunday. "It's just something that I felt was right to do," said Ms Grewal. "I'm going to be a part of his family and a part of that religion too. "It's obviously seen as a sign of good luck to get married on a significant day and I thought why not pick this perfect day." On a day with so many weddings there are some tough choices for guests as well. Dr Sharma says many will have been invited to more than one event, although there are ways around that to appease family and friends. "If the marriage is in London, it's quite possible to attend a wedding and then, very discreetly, go to another one," he said. "I'm sure that will be happening on Sunday."